The Achilles tendon is the most powerful tendon in the human body. Tendons are strong tissues that connect muscles to bone. The Achilles tendon is located in the lower back part of the leg and works with the calf muscles to provide forceful foot movements. Achilles tendon ruptures most commonly occur as a result of sports injuries. 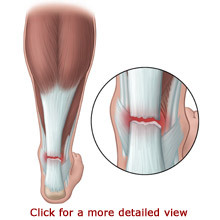 People with weakened and inflamed tendons are especially susceptible to injury. The Achilles tendon is a large, strong fibrous cord that connects the calf muscles in the back of the leg to the back of the heel bone (calcaneus). The Achilles tendon and the calf muscles work together to point the foot downward and to raise the heel upward. You rely on it virtually every time you move your foot. This motion enables you to walk, jump, stand on your toes, and climb stairs. If the Achilles tendon ruptures you may be unable to perform such movements. The Achilles tendon can rupture when a flexed foot sustains a sudden strong force and the calf muscles powerfully shorten. This can happen while playing sports. Sports such as basketball, football, and tennis require quick movements, jumping, and cutting that can create an imbalance of pressure on the leg and foot. Achilles tendon rupture can also result from tendons weakened over time by Achilles tendonitis (chronic inflammation of the tendon). A loud “pop” may be heard when the Achilles tendon ruptures. You may feel a sudden painful “snap” in the back of your calf or lower leg followed by sharp severe pain. Swelling and skin discoloration in the back of the calf will often develop because of bleeding beneath the skin. You may be unable to point your foot downward or raise your heel upward, making it difficult to walk, jump, stand on your toes, and climb stairs. In order to diagnose an Achilles tendon rupture, your podiatrist will perform an examination and review your medical history. Clinical tests are used to help diagnose the condition. The Thompson Test is the most reliable physical examination to confirm a suspected Achilles tendon rupture. The test is simple to perform. You will be asked to face down with a straight leg. Your podiatrist will squeeze the calf muscles in your leg. If the foot does not point, the Achilles tendon may have ruptured. The foot will not be able to point because the tendon connecting the calf muscles at the heel is torn. Some physicians may order medical imaging tests, such as ultrasound or Magnetic Resonance Imaging (MRI), to determine the location and type of tendon tear. An ultrasound uses sound waves to create an image when a device is gently placed on the skin. An MRI provides a very detailed view of body structures. The MRI equipment focuses on the leg area while the individual remains very still. In some cases, x-rays are ordered to assess if the leg or heel bone was injured when the Achilles tendon ruptured. Each case of Achilles tendon rupture is evaluated on an individual basis. It is important for you and your podiatrist to discuss and determine which treatment options are most appropriate. Treatment for Achilles tendon ruptures can be surgical or nonsurgical. Surgery is not recommended for inactive people or those who are at high risk for complications or cannot tolerate surgery. Treatment for these individuals includes approximately six weeks of casting to allow the tendons to heal, followed by physical therapy. Physical Therapists focus on improving physical functioning by addressing muscle strength, flexibility, endurance, balance, and coordination. This method can be effective, and it avoids the risks associated with surgery. For individuals with active lifestyles and who want to return to strenuous recreational activities, physicians recommend surgery to reattach the torn Achilles tendon. Surgery is generally very effective and the risk of complication is typically low. The surgery will require anesthesia, but is usually performed on an out-patient basis. During surgery, the surgeon makes a three to four inch opening behind the ankle and reattaches the tendon ends to each other or to the bone. The foot is placed in a pointed position in a splint or short leg cast. The splint or cast is worn for four to six weeks. You will participate in physical therapy when the healing is complete. Individuals with surgical and non-surgical repair have good to excellent rates of returning to full activity levels with proper treatment and rehabilitation. The length of time for healing is highly variable. Generally, individuals with surgical repair can return to walking and swimming at six weeks, and gradually return to sports several months from the surgery. They have a lower risk of repeated tendon rupture and a better chance of regaining full strength in the leg. Individuals with non-surgical repair will often participate in rehabilitation for a longer period of time. They have a higher risk of repeated tendon rupture and loss of strength. Achilles tendon ruptures most commonly occur in men between the ages of 30 and 50 years old that participate in sports. People with Achilles tendonitis are susceptible to tendon rupture.